The Lutheran Church in North Carolina and throughout the United States has experienced several schisms, mergers, and other organizational changes that have resulted in a number of bodies adhering to related but theologically distinct beliefs. Lutheranism is rooted in the teachings of sixteenth-century German reformer Martin Luther, whose central theology is based on the premise that salvation comes from God's grace alone rather than through human effort. A wide disparity in doctrinal interpretation, particularly in relation to church hierarchy and authority, as well as ethnic differences among immigrant groups, especially those from Germany and Scandinavia, impeded Lutheran unity in North Carolina and across the United States for much of the nineteenth and twentieth centuries. Most of the early congregations in North Carolina depended on lay leadership and a small number of pastors coming down from Pennsylvania. In 1772 Zion (now Organ) congregation in Rowan County and St. John's in Cabarrus County sent delegates to Germany in search of a pastor, returning with Pastor Adolphus Nussmann and Johann Gottfried Arends, a schoolteacher who was later ordained. With increasing numbers of congregations came the need for organization, and in 1803 the North Carolina Lutheran Synod, the first such body in the South, was established, with headquarters in Salisbury. In 1820-as a consequence of theological differences between advocates of "old" Lutheranism and "American," progressive Lutheranism-several North Carolina congregations and pastors joined with others in South Carolina, Tennessee, and Virginia to form the more conservative Evangelical Lutheran Tennessee Synod. That same year the General Synod, the first national organization of American Lutherans, was formed in Hagerstown, Md. Representatives from both the North Carolina and Tennessee Synods participated. Over the course of the nineteenth century, North Carolina's Lutherans encountered further divisions. During the Civil War, synods in North Carolina, Tennessee, and elsewhere in the South withdrew from the national General Synod over political differences. 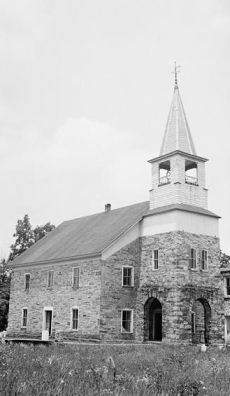 Following the war, several Lutheran pastors in Rowan and Cabarrus Counties encouraged the black members of their churches to form their own congregations and trained four African American men as ministers. The new ministers subsequently formed an all-black synod known as the Alpha Synod, but owing to economic factors and the death of one of its leading pastors, the synod had a short life. The black congregations asked for help from the North Carolina Synod, but it could provide none given the strain on its postwar resources. At one time there were several African American congregations in Rowan, Cabarrus, and Guilford Counties and a Lutheran college for blacks in Greensboro. Most of these congregations no longer exist, although mergers among them have enabled a few to survive. In 1880 the North Carolina Synod established a college in Conover. In 1891 the question of where the college should be located was revisited, however, and the school was moved to Hickory, where it was opened with the name of Highland College. This institution was the precursor of modern-day Lenoir-Rhyne College. The establishment of numerous church-supported schools for elementary-age children followed during the next few decades. Lutherans in North Carolina and other southern states remained organizationally isolated from their northern brethren until the early twentieth century, when a series of mergers began to take place at both the national and regional levels. In 1921 the North Carolina Synod, with 77 congregations, merged with the Tennessee Synod, with 119 congregations, to form the United Evangelical Synod of North Carolina. This synod in turn became part of the newly formed United Lutheran Church in America (ULCA), which also had incorporated the General Synod. In 1962 the ULCA and other Lutheran bodies merged to form the Lutheran Church in America (LCA). Further unification efforts led in 1988 to the formation of the Evangelical Lutheran Church in America (ELCA), a massive organization that incorporated the more than 5 million members of the LCA (including those in the North Carolina Synod), the American Lutheran Church, and the Association of Evangelical Lutheran Churches. By the early 2000s, most of North Carolina's 300-plus Lutheran congregations were under the jurisdiction of the ELCA, although some remained part of the Lutheran Church, Missouri Synod or of minor bodies that reflected continuing historic, cultural, or theological distinctions. Lenoir-Rhyne College in Hickory remained one of the 28 ELCA-controlled colleges and universities in the United States and the only Lutheran institution of higher learning operating in North Carolina. H. George Anderson, The North Carolina Synod through 175 Years (1978). Raymond M. Bost and Jeff L. Norris, All One Body: The Story of the North Carolina Lutheran Synod, 1803-1993 (1994). Bernard W. Cruse, Foundations of Lutheranism in North Carolina (1973). Jacob L. Morgan, Bachman S. Brown Jr., and John Hall, eds., History of the Lutheran Church in North Carolina (1953). Organ Evangelical Lutheran Church, State Route 1006, Rockwell, Rowan County, NC. 1. Historic American Buildings Survey, Archie A. Biggs, Photographer June 26, 1937. Image courtesy of Library of Congress, reproduction #: HABS NC,80-FAITH.V,2--1. 1 January 2006 | Calhoon, Robert M.; Park, Karl M.